This Marquise diamond is 0.34 carat in weight, and comes with Excellent polish and Very Good symmetry, as verified from an independent gemological laboratory. The diamond is graded F in colour, and has a clarity grade of VVS2. The diamond's GIA grading report number is 5323047690, which will detail further its specifications and measurements, and will also come with the purchase of the stone. AUD 2,107 Excl. Duties / Taxes. This Marquise diamond is 0.57 carat in weight, and comes with Very Good polish and Very Good symmetry, as verified from an independent gemological laboratory. The diamond is graded H in colour, and has a clarity grade of VVS1. The diamond's GIA grading report number is 6312349238, which will detail further its specifications and measurements, and will also come with the purchase of the stone. AUD 1,028 Excl. Duties / Taxes. This Marquise diamond is 0.44 carat in weight, and comes with Good polish and Good symmetry, as verified from an independent gemological laboratory. The diamond is graded E in colour, and has a clarity grade of SI1. The diamond's GIA grading report number is 2195810943, which will detail further its specifications and measurements, and will also come with the purchase of the stone. AUD 5,069 Excl. Duties / Taxes. This Marquise diamond is 1 carat in weight, and comes with Good polish and Fair symmetry, as verified from an independent gemological laboratory. The diamond is graded D in colour, and has a clarity grade of SI1. The diamond's GIA grading report number is 1192223083, which will detail further its specifications and measurements, and will also come with the purchase of the stone. This Marquise diamond is 0.31 carat in weight, and comes with Very Good polish and Very Good symmetry, as verified from an independent gemological laboratory. The diamond is graded D in colour, and has a clarity grade of VS1. The diamond's GIA grading report number is 7302364605, which will detail further its specifications and measurements, and will also come with the purchase of the stone. AUD 2,092 Excl. Duties / Taxes. This Marquise diamond is 0.5 carat in weight, and comes with Excellent polish and Very Good symmetry, as verified from an independent gemological laboratory. The diamond is graded E in colour, and has a clarity grade of VVS2. The diamond's GIA grading report number is 6272639529, which will detail further its specifications and measurements, and will also come with the purchase of the stone. AUD 1,409 Excl. Duties / Taxes. This Marquise diamond is 0.5 carat in weight, and comes with Very Good polish and Very Good symmetry, as verified from an independent gemological laboratory. The diamond is graded J in colour, and has a clarity grade of VVS2. The diamond's GIA grading report number is 5273769182, which will detail further its specifications and measurements, and will also come with the purchase of the stone. This Marquise diamond is 0.44 carat in weight, and comes with Good polish and Good symmetry, as verified from an independent gemological laboratory. The diamond is graded D in colour, and has a clarity grade of VS2. The diamond's GIA grading report number is 2101881832, which will detail further its specifications and measurements, and will also come with the purchase of the stone. AUD 4,950 Excl. Duties / Taxes. This Marquise diamond is 0.91 carat in weight, and comes with Very Good polish and Good symmetry, as verified from an independent gemological laboratory. The diamond is graded D in colour, and has a clarity grade of SI2. The diamond's GIA grading report number is 2165451145, which will detail further its specifications and measurements, and will also come with the purchase of the stone. AUD 31,728 Excl. Duties / Taxes. This Marquise diamond is 3.01 carat in weight, and comes with Very Good polish and Very Good symmetry, as verified from an independent gemological laboratory. The diamond is graded J in colour, and has a clarity grade of SI1. The diamond's GIA grading report number is 1152574346, which will detail further its specifications and measurements, and will also come with the purchase of the stone. This Marquise diamond is 0.81 carat in weight, and comes with Good polish and Very Good symmetry, as verified from an independent gemological laboratory. The diamond is graded F in colour, and has a clarity grade of SI1. The diamond's GIA grading report number is 2195178925, which will detail further its specifications and measurements, and will also come with the purchase of the stone. 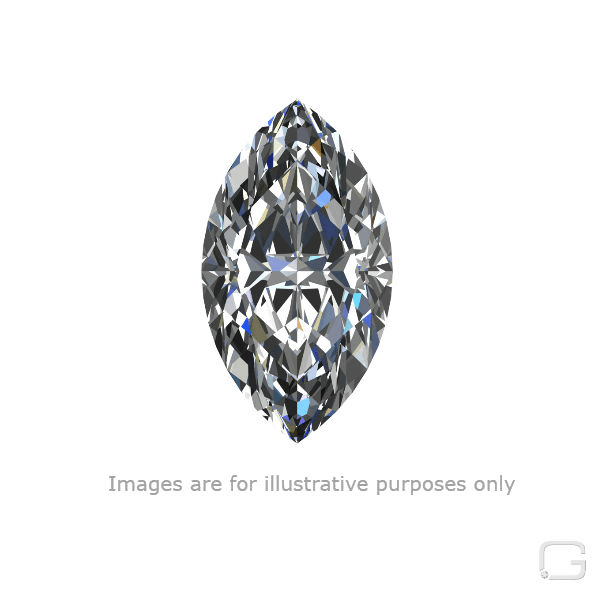 This Marquise diamond is 2.02 carat in weight, and comes with Good polish and Good symmetry, as verified from an independent gemological laboratory. The diamond is graded E in colour, and has a clarity grade of SI1. The diamond's GIA grading report number is 12157591, which will detail further its specifications and measurements, and will also come with the purchase of the stone. AUD 4,567 Excl. Duties / Taxes. This Marquise diamond is 0.78 carat in weight, and comes with Excellent polish and Very Good symmetry, as verified from an independent gemological laboratory. The diamond is graded G in colour, and has a clarity grade of VVS2. The diamond's GIA grading report number is 2191982800, which will detail further its specifications and measurements, and will also come with the purchase of the stone. AUD 33,213 Excl. Duties / Taxes. This Marquise diamond is 1.7 carat in weight, and comes with Excellent polish and Excellent symmetry, as verified from an independent gemological laboratory. The diamond is graded D in colour, and has a clarity grade of IF. The diamond's GIA grading report number is 5191272986, which will detail further its specifications and measurements, and will also come with the purchase of the stone. AUD 1,176 Excl. Duties / Taxes. This Marquise diamond is 0.31 carat in weight, and comes with Excellent polish and Very Good symmetry, as verified from an independent gemological laboratory. The diamond is graded E in colour, and has a clarity grade of VVS2. The diamond's GIA grading report number is 1288806109, which will detail further its specifications and measurements, and will also come with the purchase of the stone. This Marquise diamond is 0.55 carat in weight, and comes with Good polish and Good symmetry, as verified from an independent gemological laboratory. The diamond is graded I in colour, and has a clarity grade of VS2. The diamond's GIA grading report number is 6275768972, which will detail further its specifications and measurements, and will also come with the purchase of the stone. AUD 2,773 Excl. Duties / Taxes. This Marquise diamond is 0.76 carat in weight, and comes with Very Good polish and Good symmetry, as verified from an independent gemological laboratory. The diamond is graded I in colour, and has a clarity grade of VS1. The diamond's GIA grading report number is 5182497229, which will detail further its specifications and measurements, and will also come with the purchase of the stone. AUD 5,343 Excl. Duties / Taxes. This Marquise diamond is 1.19 carat in weight, and comes with Good polish and Very Good symmetry, as verified from an independent gemological laboratory. The diamond is graded J in colour, and has a clarity grade of SI1. The diamond's GIA grading report number is 2296261256, which will detail further its specifications and measurements, and will also come with the purchase of the stone. AUD 1,040 Excl. Duties / Taxes. This Marquise diamond is 0.3 carat in weight, and comes with Very Good polish and Very Good symmetry, as verified from an independent gemological laboratory. The diamond is graded E in colour, and has a clarity grade of VS2. The diamond's GIA grading report number is 1299869120, which will detail further its specifications and measurements, and will also come with the purchase of the stone. This Marquise diamond is 0.5 carat in weight, and comes with Very Good polish and Very Good symmetry, as verified from an independent gemological laboratory. The diamond is graded F in colour, and has a clarity grade of VVS1. The diamond's GIA grading report number is 2297840510, which will detail further its specifications and measurements, and will also come with the purchase of the stone. AUD 1,265 Excl. Duties / Taxes. This Marquise diamond is 0.31 carat in weight, and comes with Excellent polish and Very Good symmetry, as verified from an independent gemological laboratory. The diamond is graded E in colour, and has a clarity grade of VVS1. The diamond's GIA grading report number is 1285788589, which will detail further its specifications and measurements, and will also come with the purchase of the stone. AUD 1,615 Excl. Duties / Taxes. This Marquise diamond is 0.41 carat in weight, and comes with Very Good polish and Very Good symmetry, as verified from an independent gemological laboratory. The diamond is graded F in colour, and has a clarity grade of VS1. The diamond's GIA grading report number is 1329404564, which will detail further its specifications and measurements, and will also come with the purchase of the stone. This Marquise diamond is 0.33 carat in weight, and comes with Good polish and Fair symmetry, as verified from an independent gemological laboratory. The diamond is graded E in colour, and has a clarity grade of VS1. The diamond's GIA grading report number is 1196327081, which will detail further its specifications and measurements, and will also come with the purchase of the stone. AUD 5,171 Excl. Duties / Taxes. This Marquise diamond is 0.9 carat in weight, and comes with Very Good polish and Very Good symmetry, as verified from an independent gemological laboratory. The diamond is graded F in colour, and has a clarity grade of SI1. The diamond's GIA grading report number is 5306328044, which will detail further its specifications and measurements, and will also come with the purchase of the stone. AUD 1,206 Excl. Duties / Taxes. This Marquise diamond is 0.35 carat in weight, and comes with Excellent polish and Very Good symmetry, as verified from an independent gemological laboratory. The diamond is graded G in colour, and has a clarity grade of VVS1. The diamond's GIA grading report number is 6281791831, which will detail further its specifications and measurements, and will also come with the purchase of the stone. AUD 29,637 Excl. Duties / Taxes. This Marquise diamond is 2.03 carat in weight, and comes with Excellent polish and Excellent symmetry, as verified from an independent gemological laboratory. The diamond is graded D in colour, and has a clarity grade of SI1. The diamond's GIA grading report number is 6282654970, which will detail further its specifications and measurements, and will also come with the purchase of the stone. AUD 4,016 Excl. Duties / Taxes. This Marquise diamond is 1.01 carat in weight, and comes with Good polish and Good symmetry, as verified from an independent gemological laboratory. The diamond is graded I in colour, and has a clarity grade of SI2. The diamond's GIA grading report number is 2193830819, which will detail further its specifications and measurements, and will also come with the purchase of the stone. This Marquise diamond is 0.3 carat in weight, and comes with Very Good polish and Very Good symmetry, as verified from an independent gemological laboratory. The diamond is graded G in colour, and has a clarity grade of VS2. The diamond's GIA grading report number is 6282795114, which will detail further its specifications and measurements, and will also come with the purchase of the stone.